Will world leaders curb climate change? The secretary-general of the United Nations recently warned that the world is “approaching environmental tipping points” due to “runaway climate change.” The latest scientific studies indicate that warming global temperatures are exacerbating extreme weather events such as record-breaking droughts, wildfires, floods and major hurricanes. Opponents of efforts to reduce heat-trapping greenhouse gases say such measures would impede economic growth, both in developed and developing countries. However, nearly 200 countries agreed in December to negotiate a new climate change treaty, to be completed in 2015, which would require both industrialized and developing countries to reduce their emissions. But some climate experts say the world has missed its chance to stabilize emissions below levels that will cause intense warming, with severe repercussions. After a string of weather-related disasters in 2012-13, scientists say it is increasingly clear that the world’s climate is changing. Experts and political leaders widely agree that rising concentrations of heat-trapping greenhouse gases (GHGs) in Earth’s atmosphere are warming the planet. Recent studies indicate that warming temperatures are contributing to extreme weather events such as record-breaking drought and wildfires in Australia, rapidly melting glaciers and historic storms like Superstorm Sandy, which flooded large sections of New York City and the New Jersey coast in October 2012. Numerous other studies conclude that if Earth continues to warm at current rates, the effects will pose severe risks to human lives, health, property and critical resources, including farmland and drinking water. But even as the evidence of changing global climate becomes increasingly clear, political action is lagging. In the United States, President Obama is pursuing measures that don’t need congressional approval because scant support exists in Congress for national limits on greenhouse gas emissions, a large percentage of which comes from burning fossil fuels. 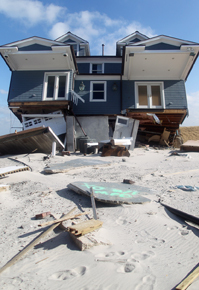 Is over-building putting coastal regions at risk? Do shortages imperil the region's growth?